Rare Solar Eclipse in 2017 and Another One in 2024 Will Mark Giant ‘X’ Across US ! The Last 7 Years ? On Aug. 21, 2017, something is going to happen in the United States that has not happened since 1918. On that date, a total solar eclipse will be visible all the way from the east coast to the west coast. Incredibly, another rare solar eclipse of this nature will move across the country just seven years later in 2024. 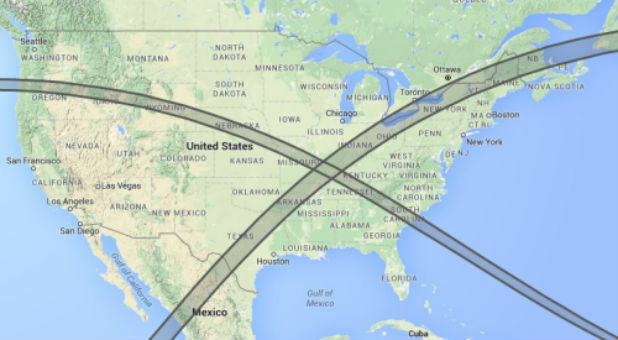 If you plot the projected courses of these two solar eclipses on a map, you will find that they form a giant “X” across the continental United States. In the Scriptures, Jesus told us that “there shall be signs in the sun, and in the moon and in the stars” just prior to His return, and many are speculating about what this giant “X” might mean. Astronomers have been buzzing about the upcoming solar eclipse on Aug. 21 because it is so very rare. In fact, many are already making plans to travel to specific locations in order to have an optimal viewing experience. The following description of what will happen on that day comes from Fox News: Day will turn into night across the United States on Aug. 21, as the country experiences its first total solar eclipse in decades. On this day, the moon will pass directly between the earth and the sun, casting a shadow on the United States that will track from Oregon to South Carolina. This will be the first time since 1918 that a total solar eclipse will be visible from the west coast to the east coast of the United States. The most recent total solar eclipse visible in the United States occurred in 1979; however, it was only visible across the Pacific Northwest. This is something that does not happen very often, and that is why it is so extraordinary that another solar eclipse will be visible in large portions of the nation just seven years later in 2024. When you chart the courses of both eclipses on a map, you see that they form a giant “X” right over the center of the country. Could this giant “X” have some sort of meaning? According to The Washington Post, some believe that “the two eclipses that are slated to travel across the United States in 2017 and 2024, together marking an X across the nation, could be the starting and ending signs bookmarking a seven-year period of awful tribulations that Revelations [sic] says waits in store for nonbelievers who are left behind on Earth when the rapture occurs.”. But could it have some other sort of significance ? The truth is that I don’t know, and I want to make that very clear, but I do find it interesting that the heart of the “X” falls in portions of Kentucky, Illinois and Missouri. An area spanning parts of Missouri, Illinois and Kentucky will be the nexus of the next two total solar eclipses to occur in the U.S., on Aug. 21, 2017, and April 8, 2024. Because the 2017 eclipse travels across the country from northwest to southeast and the 2024 eclipse makes its way through the nation from southwest to northeast, the two paths cross each other and create a zone of overlapping totality of almost 9,000 square miles, or roughly the size of New Jersey. That certainly does not mean that the coming New Madrid earthquake will happen on any particular date, but it is definitely a very interesting “coincidence.” This has also caused me to reflect on something that John Paul Jackson once said. Back in 2008, he made a DVD called “The Perfect Storm” in which he detailed a whole host of disasters that God showed him are coming to America. At the very beginning of the DVD, John Paul explained that the majority of the things that he was going to talk about on the DVD would not happen for about a decade. Well, when you add 10 years to 2008, that brings us to 2018. In other words, the time frame that John Paul Jackson warned us about nearly a decade ago also lines up with the time frame of these upcoming solar eclipses. Is that just another “coincidence”? I don’t have any definitive answers for you all. Today, I am just asking some questions. In recent months, I have been writing much about the upcoming judgment on America. I know a lot of people don’t like to hear these kinds of warnings, but we shouldn’t ignore the fact that God is speaking to large numbers of individuals all over the globe about these things. Another very unusual celestial event will happen on September 23rd. It is being referred to as “the Revelation 12 sign,” and apparently, this will be the very first time that the scene described in Revelation chapter 12 will be depicted in the stars in about 7000 years. The Book of Revelation, which is full of extraordinary imagery, describes a woman “clothed with the sun, with the moon under her feet and a crown of twelve stars on her head” who gives birth to a boy who will “rule all the nations with an iron scepter” while she is threatened by a red, seven-headed dragon. On Sept. 23, we will be able to see this scene in the heavens, and you can find out more about this very unusual celestial event on YouTube right here. I don’t know, but Jesus did repeatedly tell us to watch for signs of His return, so I am watching.